By appearances, Hell Hound (Zebra Books, Oct 1977) seems to be a cheap, tawdry knockoff thriller, just another nature-gone-amok horror novel in the wake of Jaws, except this one is exploiting an animal near and dear to the human heart. The name Ken Greenhall is familiar to no one, there are no blurbs from famous authors or reviewers, and those eyes, those demonically crimson canine eyes, oh man, that is just the cheesiest, just the worst, appearing stuck in lazily as the cover went to print. So you can't be blamed for thinking Hell Hound is bottom-of-the-barrell Zebra garbage. You'd be wrong though. Hell Hound is a revelation: dog as sociopath (that tagline A thriller of the surreal and the supernatural is just an irrelevant Zebra add-on). In fewer than 200 pages, we get a thoughtful, chilling, penetrating glimpse into the mind of man's so-called best friend. Baxter the bull terrier makes Cujo seem like a clumsy amateur. 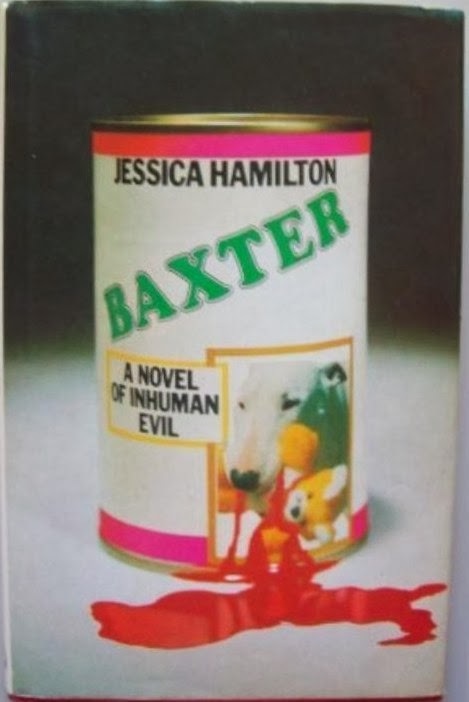 First, a behind-the-scenes note: the book was published in the US under Greenhall's name with the title Hell Hound, while in the UK, it was titled Baxter and credited to his pseudonym Jessica Hamilton, under which he'd written the utterly marvelous Elizabeth, out the previous year. I believe both editions were pub'd in Oct '77. Also in the UK it was published in actual hardcover with the subtitle A Novel of Inhuman Evil, and a dustjacket that looks more like a mainstream pop thriller (I don't get the can image - dog food?) than its tacky American drugstore rack paperback. The book is not easy to come by for cheap. However last summer I finally found a used copy on Abebooks, for $3.95 and free shipping, even. 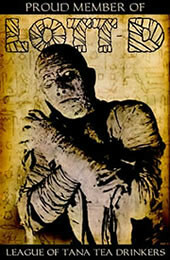 It was pure random blind luck, I know that, so don't lose heart, horror fiction fans - be diligent in your book searches! Pity is not something I want to encourage in myself. It is something for humans to feel, one of the jumble of odd sentiments they burden themselves with. Their emotions are like diseases, I think; diseases that can spread among those who try to understand them. Let their feelings be a mystery, like the dozens of other strange traits they have... The ways in which they deceive themselves are endless. 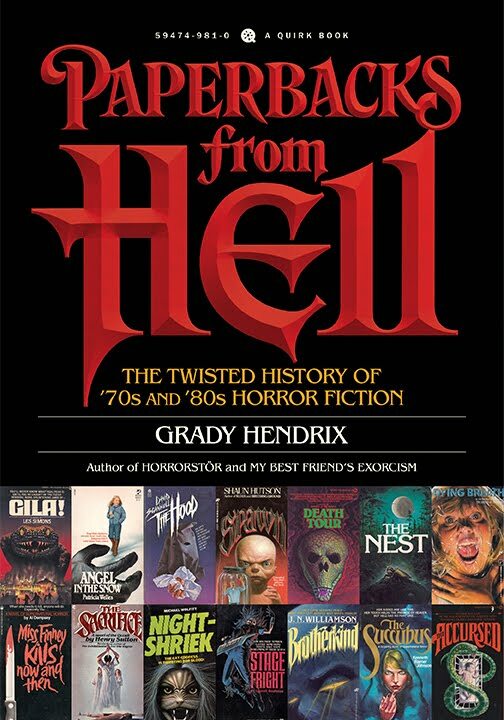 Fright.com's review - I recommend Z7's review as well, the only reviews I found online - perceptively notes that Hell Hound is akin to such powerful unique novels as JG Ballard's Crash (1973) and Iain Banks's The Wasp Factory (1984). Like those works, the narrative voice is detached but brilliant, its psychological insights deft and razor-sharp, its originality startling. What if...? What if...? The dispassion in Baxter's voice is electrifying. Life in Mrs. Prescott’s perhaps lower middle-class home is a dreary affair. A widow whose daughter’s husband breeds dogs, of which Baxter is one and given to her after her husbands dies, Prescott is distrustful and uptight, withholding of affection, and feels neither one way or the other about the bull terrier: She had never been able to decipher his expressions. He had always looked either impassive or malevolent to her. Baxter is intrigued by his own conflicting feelings about her; the first time he pushes her at the head of the staircase he pulls her back in time using his powerful jaws. He tries to escape to the couple across the street - I need their joy - but of course he is brought right back. Baxter has no choice, and her death seems foretold for her: She had given her affection to another creature: an act she had all her life been convinced was dangerous. Now she knew she had not been wrong to mistrust affection... and as her head hits the floor at the bottom of the stairs: There was a faint aroma of floor polish. She smiled. "I was not wrong," she whispered. Take the beast, she thought, take the people, the houses, the trees. Have as many pregnancies and ideals as you can manage; you won't save any of it. Something or someone will defeat you. My pleasure increases endlessly... She has learned to feed me fresh, raw meat. She brings me large, mysterious bones, which I crack fiercely, feeling pride and pleasure in the strength of my teeth and jaws. Once ensconced in the Grafton home, Baxter feels satisfaction and control, and knows the man and woman rely on him. There is order, a place for everyone. And then the inevitable: the woman is changing. Her body is becoming thicker and thicker, and there is an added scent about her that I find unpleasant. It is almost as if she had the scent of two people. Uh-oh. And it all plays out precisely as you think, which makes it all the scarier. The newborn’s mindlessness and many stupidities offend Baxter’s notions of power and weakness, and he resents the parents’ dotage on the offspring, and he now waits for an opportunity to - well, you know. And after Baxter realizes too late, their love has turned to fear. "He had these cyanide capsules he was going to use to kill himself and Eva. But he wasn't sure they would work - he didn't rust the people that gave them to him. So he gave one to Blondie. He watched her die. Then he had her puppies shot." This long review doesn't even touch on everything I loved about Hell Hound. Definitely one of the best novels I've read for TMHF, and one that deserves to be much more well-known and not simply as a "cult classic." It's obvious: I cannot recommend it highly enough! It is the kind of “horror” novel that makes you look askance at the genre’s hallmarks - at the flamboyant excesses of blood and gore streaked across the pages and the faces of psychotic killers, of the bizarre monstrosities conjured up, of the contrivances of plot and circumstance, character and dialogue, the elaborate fantasies of evil and demons and gods beyond space and time. Who needs 'em? Not Greenhall; he dispenses with all that and gives us the dispassion of a creature which beggars our belief in good and in compassion. This is horror found in one of our most recognized and beloved animals, one with which countless millions have bonded daily for millennia, one which seems to exist in our world but is more like an utter alien, staying its power till that moment in which we innocently bare our hairless throats to its ivoried jaws, and then revealing what its instinct has been since birth. Sounds terrific. I did a search at the usual haunts, and didn't come away with anything that wasn't either overpriced or required expensive shipping from the UK. I've added to to my mental list, though, and will be sure to keep an eye out for it. Thanks for the heads-up on this one. This does sound good will! I took your advice about "Elizabeth" not too long ago and thoroughly enjoyed it. So I might have to scour for this one. 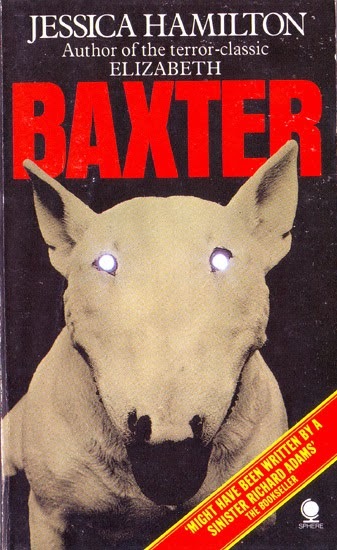 As an interesting side note-once you mentioned the title had been changed to Baxter and it was a bull terrier I knew I had heard of this before. It was made into a movie a while back-it might have beenBrit, or maybe French? Dont recall...I haven't seen the film but there was good press about it as I remember. Check IMBD for it. Yes, it was a French film released in 1990. I remember seeing it in the arthouse sections of videostores back then. Watched it a couple years ago when I first heard of this novel. Good, def worth a watch, but I prefer Greenhall's style, which is what really made HELL HOUND work for me. 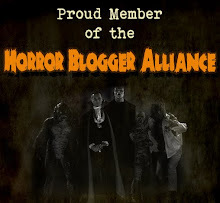 "Fright.com's review - the only review I've found of the novel online"
I saw that review! I must have posted before revising that section. Thanks for the mention! Great book, too long ignored. This was added to my ever growing list so did a search for it... £22 a certain popular site wanted for it!! A tad pricey even though the book sounds great. The can on the UK hardcover is possibly due to Baxters being the brand name of a soup in the U.K.